This app is designed for use in therapy with adults with dysphasia and other effects of stroke or brain injury. 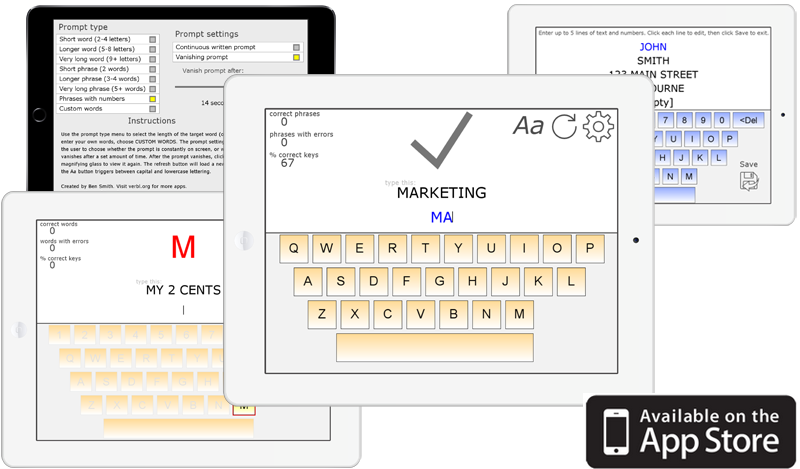 It uses errorless learning principles to help rehabilitate use of the QWERTY keyboard layout by prompting users to type random or customised words and phrases. Configurable for users that require more consistent cues and adapts to continued errors with clearer cues until the correct word is typed. When an incorrect letter is pressed, audible and visual feedback is given, and the right key is highlighted. Records the percentage of correct button presses and the total number of error-free words or phrases. A simplified keyboard containing only letters, the space bar and (optionally) numbers. Choose the length and type of the target – short or long words and phrases, with or without numbers. Choose whether the prompt remains on the screen or disappears after a configurable delay of 1 to 30 seconds. Clear reinforcing, motivating feedback for correct words and phrases. Persistent settings that are saved between sessions. App comes with for built-in prompts.